In the early fall of 2010, workers installed the largest solar deployment in Virginia on the Hartzler library roof. It has the capacity to generate104.3 kilowatts of electricity from 328 high-efficiency photovoltaic panels and is projected to eliminate more than 6,000 tons of greenhouse gas emissions over 35 years. AN ESSAY HEADLINED “A Climate-Change Activist Prepares for the Worst,” published in the Outlook section of the Washington Post one recent Sunday (Feb. 27, 2011), sparked 444 online comments before the Post closed the discussion. The essay also prompted more than 1,800 people to recommend it via Facebook. The writers of the 444 postings were sharply divided, perhaps 35 to 65 percent. Ten years ago, I put solar panels on my roof and began eating locally grown food. I bought an energy-efficient refrigerator that uses the power equivalent of a single light bulb. I started heating my home with a stove that burns organically fertilized corn kernels. I even restored a gas-free lawn mower for manual yardwork. As a longtime environmental activist, I was deeply alarmed by new studies on global warming, so I went all out. I did my part. Tidwell went on to explain, however, that he feels “we’re running out of time” to avert the physical and social upheavals that will result from global warming. Fourteen months earlier (Dec. 6, 2009), the Post’s Outlook section published another essay by Tidwell in which he criticized the “go green” movement for leading people to believe that small changes in one’s personal lifestyle would add up to ultimately rescuing the planet. He said personal changes – like the way he used a Prius and ate a “low-carbon-footprint vegetarian diet” – are drops in the proverbial bucket. He challenged his readers: “No more compact fluorescent light bulbs. No more green wedding planning. No more organic toothpicks for holiday hors d’oeuvres . . . Given the divided readership of the Washington Post, it seems safe to assume that the readership of Crossroads is not united on the subject of climate change. 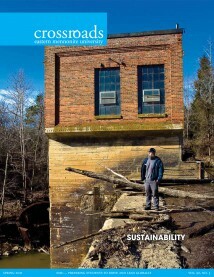 When we asked readers to “tell us your path to ‘going green’” on the back cover of the fall/winter 2010-11 issue of Crossroads, we received a flurry of contributions from alumni who are putting solar panels on their roofs, riding bikes or walking instead of driving a mile or so, growing as much of their own organic food as possible, and building well-insulated homes from local materials. Yet, even in the absence of messages from readers uninterested in “going green,” there are certainly tens of thousands of us who don’t choose to live as simply as Martha Ann Burgard ’66 in Alabama or as self-sufficiently as Mary Beth ’72 and Lester ’71 (MA-religion ’94) Lind in West Virginia. The primary concern is that a world of over six billion people striving for material satisfaction is drawing ever more heavily from finite supplies of natural resources to fuel an economic growth model destined to lead to an ecological disaster and global poverty without precedence. Those who disagree with Hawken tend to hold the opposite view on “unrestrained economic growth.” They believe the innovativeness and expansiveness of capitalism hold the key to solving the problems facing humanity and the rest of the natural world, including possibly climate change (without necessarily conceding that this is an actual problem to be solved). Andrew K. Jenner ’04, a freelance writer who is largely responsible for the reporting on pages 8 through 36, suggested that we follow up this issue of Crossroads by inviting readers to discuss “going green” in the form of a moderated online blog. We have set up a forum for discussion, open until June 1, 2011, at. While we invite discussion, we must confess that a clear majority of EMU’s current administrators, faculty, staff and students seem to be arrayed on the side of those who believe the preponderance of scientific evidence of major climate change and who wish to reverse climate change or at least responsibly address its devastating effects. The statement made four points: (1) human-induced climate change is real; (2) the consequences of climate change will be significant, and will hit the poor the hardest; (3) Christian moral convictions demand our response to the climate change problem; and (4) the need to act now is urgent – governments, businesses, churches, and individuals all have a role to play in addressing climate change, starting now. In the spring of 2008, the EMU board of trustees decided that all new buildings at EMU would meet basic LEED standards, at a minimum. (LEED stands for Leadership in Energy and Environmental Design.) This decision followed presentation to the board of semester-long research by 14 students in a “Green Design” class taught by science professors Douglas Graber Neufeld and James (Jim) M. Yoder ’94, who both did their PhD dissertations on topics related to the environment. 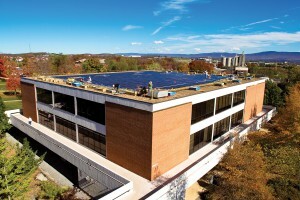 In the fall of 2010 EMU became host to the largest solar deployment in Virginia, with capacity to generate 104.3 kilowatts of electricity from 328 high-efficiency photovoltaic panels on its library roof. The lead visionary for the project was Tony Smith, PhD, co-director of EMU’s MBA program and CEO of a private company called Secure Futures. The 1970s is also when EMU planted an arboretum and experimented on its own land with the best way to treat soil for maximum vegetable production. Recycling of paper, glass and plastic is now integrated into the work of EMU’s Physical Plant Department, which collects these materials by bicycle rather than van. Earthkeepers, now run by students, continues to work at composting – student volunteers collect discarded food and biodegradable paper from the dining hall for composting near the Suter Science Center. They also join with others in running Food & Farming Week each year. In 1986, EMU took the risk of installing an innovative, but then-unproven, closed-loop heating and cooling system in the newly built Campus Center. Designed by LeRoy Troyer, an Indiana architect who was raised Amish, the building has withstood the test of time in being a model of energy efficiency. Physical plant director C. Eldon Kurtz ’76 estimates that the center saved EMU $3 to $4 million in energy costs its first ten years of use. Reaching even deeper into EMU’s history, in the decade after it was founded in 1917, EMU had pig pens, cows, poultry sheds, corn fields, and vegetable gardens on its grounds, with students fresh off the farm who knew how to deal with such matters. Ironically, however, most of these students were more interested in reducing their need to do manual labor to survive. They wanted to engage in more intellectual pursuits, rather than remaining bound to the farms of their ancestors. EMU has embraced a Quality Enhancement Plan (QEP) – called “Peace with Creation” – whereby every undergraduate learns about the importance of good stewardship for creation and reflects on ways that he or she can help. First-year students are given writing assignments on the topic and sustainability is threaded into the coursework of every major. As part of this QEP, cross-cultural trips are being retooled to increase environmental awareness. Vice-president and undergraduate dean Nancy Heisey, PhD – who has committed to using public transportation when possible and to walking to destinations a less than a mile or so from her home or campus – will be leading a trip in the summer of 2011 where the students travel (to Montreal) by train instead of by airplane. Biology professor Jim Yoder led a trip to New Zealand in the summer of 2010 that included a tour of a geothermal power plant. The group also studied how New Zealand is dealing with invasive species, especially rats and possums, to restore its bird populations. TO ENGAGE IN POLITICS OR NOT? Most of the people featured in this issue of Crossroads are focused on “being the change they want to see,” to borrow Gandhi’s words. They believe that change necessarily begins with oneself and in one’s community – as in the slogan “act locally, think globally” – and that such grassroots changes can result in a shift over time in larger socio-economic paradigms. By their faithful track record on peace and justice issues, as well as their historical love of the land, Anabaptist/Mennonite faith communities have earned the right to speak out on environmental issues but are quite content to be die Stillen im Lande [quiet of the land] – an irony of our time. This is puzzling and mystifying, particularly in view of the fact that even the most isolationist groups among them will dig in their heels and take tough political stands on controversial issues when the need is clearly present…Even more puzzling, perhaps, is the nearly total absence of any identifiable Anabaptist/Mennonite political activity in an area that one would think is near and dear to their hearts – sustainable agriculture. Schmidt asked why the National Sustainable Agriculture Coalition based in Washington DC has no institutional Mennonite presence or overt Mennonite support. Recent graduate (2010) Nathan Kauffman may exemplify interest among a small minority of alumni in tackling environmental problems via political involvement. Kauffman went from majoring in history and social science at EMU to working full-time for the Chesapeake Climate Action Network. He had interned for this group while spending a semester at EMU’s Washington Community Scholars’ Center. This internship paved the way for him to be hired as its special projects person and executive assistant to Mike Tidwell, the man who wrote the provocative Post article. Kauffman has become accustomed to preparing talking points for reference and distribution, donning a business suit, and knocking on the doors of state and national legislators in the mid-Atlantic region. He and his colleagues recently (Feb. 2011) succeeded in persuading the Virginia General Assembly to pass legislation that will establish a revolving loan fund to help Virginians install solar energy projects on their homes. He then turned his attention to the Maryland General Assembly and legislation to help create off-shore wind farms. Kauffman is the only alumnus found by Crossroads to be working full-time to improve environmental policies at the state or national levels. (If there are others, please let us know at Crossroads@emu.edu.) Sharing a basement apartment in Northwest Washington with Josh Brubaker ’06 (grad student at American University), Kauffman says it is not feasible for him to practice the kind of sustainable lifestyle – a vegetable garden, solar panels, bicycling everywhere – described elsewhere in Crossroads. Living in “the District,” as locals refer to it, however, does enable Kauffman to function without owning a car. “It’s impossible to totally devote yourself to everything simultaneously,” he says. “I am working on policy, and it takes almost all of my time, and other alumni are living in truly sustainable ways, and it takes a lot of their time. At the local level in Harrisonburg, EMU senior Jakob zumFelde has worked with the New Community Project to encourage city planners and elected representatives to support a pathway for pedestrians and bicyclists to safely travel from the northwest corner of the city to downtown. Outside of the political arena, alumni certainly have worked on projects with wide environmental impact – Catherine Mumaw ’54, for example. But Mumaw, along with a few of the scientist-alumni listed on pages 33-36, seem to be the exceptions. Most environmentally aware alumni of EMU have chosen to work in their own backyards – either literally or in their immediate communities. In this issue of Crossroads, we did not attempt to delve into the widely varied views on the Biblical basis of “creation care,” or the lack thereof. That would have required a double-sized magazine or a book-length manuscript. Anyone interested in this topic is invited to read Creation & the Environment – An Anabaptist Perspective on a Sustainable World (Johns Hopkins University Press, 2000), with conversation-stimulating chapters by 14 authors, including three EMU-linked professors. Calvin Redekop, a sociologist and Conrad Grabel College professor (emeritus), edited the book. You may also enjoy reading Redekop’s chapter “Religion, Leadership, and the Natural Environment: The Case of American Evangelicals” in a new book edited by his son, Benjamin W. Redekop, Leadership for Environmental Sustainability (Routledge, 2010). For regularly updated information, visit the Evangelical Environmental Network at www.creationcare.org.